Identification: I4 is a medium-sized neuronal nucleus. It is on the dorsal midline, immediately anterior to pm7D, a big fried-egg nucleus. 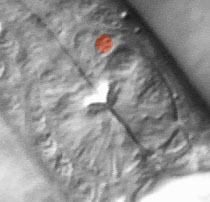 The line of three cells pm6D (also a big fried-egg), pm7D, and I4 extending from posterior to anterior along the dorsal midline of the terminal bulb is easy to recognize.